With the MINOX DC 4011 MINOX Germany launches a compact digital reportage camera for the ambitious amateur photographer which features outstanding optical quality and great flexibility. Classic elements in design and operating panel make the MINOX DC 4011 a composition of proven success and new technology. The MINOX DC 4011 consists of a CCD image sensor with 4,0 million pixel as well as a high quality MINOCTAR lens with multi-coating. This 3x optical zoom lens has an auto-focus and offers the photographer a wide scope of creativity. Individually adjusted to the 4 mega pixel sensor the MINOXAR lens offers together with the electronics and the software high quality snaps with a natural colour reproduction and high dynamic. Even in difficult light the automatic alignment provides the ideal speed to ensure that the user always gets natural colours and the correct setting for every motive. The 1,6” monitor provides an instant judgement of the picture both during and after the shot. A high flexibility is granted with an up to 128 MB SD flash card. A quick sequence and minimal shutter release delay allow for spontaneous photographing in any situation. 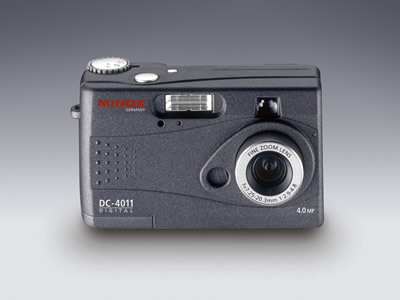 For the easy transmission between camera and computer the MINOX DC 4011 has a USB interface. Using the software, which comes with the camera, the pictures can be directly processed on the PC and passed on. The great accuracy in details and sharpness provide brilliant enlargements even in big sizes. Compact dimensions (106 x 40 x 63 mm) and easy handling make the MINOX DC 4011 the ideal companion for every occasion. The modern design with a special soft touch lacquer is a perfect match for today’s modern high-performance lifestyle products. The scope of delivery includes a CD-ROM, 2 round cell batteries, an ever-ready-case, wrist strap, USB cable and a users manual.